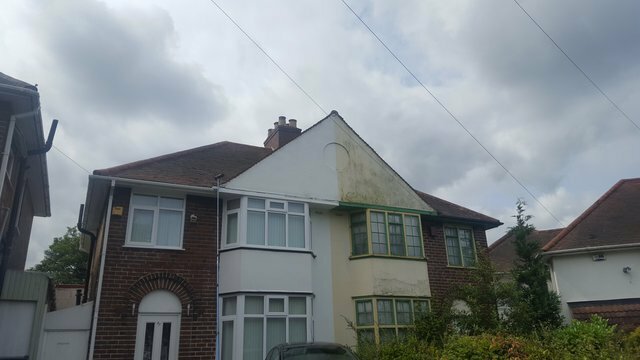 Using the latest techniques, Sutton Driveway Cleaning and softwashing can restore all types of rendering including K-Render back to its original condition, removing algae stains and algae blooming. We provide a wide range of cleaning services for commercial and residential customers in Sutton Coldfield and across Birmingham. Call us today on 07852 656 687 for more information or for a free quote. Our approach is simple and highly effective, we apply an industrial grade chemical to the render, allow the chemical to dwell and then rinse by controlled ‘soft’ pressure washing. Once the render clean is complete all uPVC/windows are cleaned using Reach and Wash.